Montblanc Star Legacy Ladies’ Small Second with 18 K red gold and brown Sfumato alligator-skin strap, MYR30,600. Created exclusively for ladies with an appreciation for the finer things in life, these newest additions to the Montblanc Star Legacy Ladies’ Small Second collection pays tribute to the extraordinary legacy of the Maison’s prestigious Minerva manufacture in Villeret and its historical pocket watches of yore. Montblanc Star Legacy Ladies’ Small Second, stainless steel top with 76 Top Wesselton diamonds and grey Sfumato alligator-skin strap, MYR22,500. Available in 32mm and 36mm sizes, which includes four stainless steel versions and one in 18K red gold, each novelty under the Star Legacy Small Seconds range has been fitted with refined round cases featuring curved sides that creates an elegant pebble-like shape. Strap options include stainless steel bracelets and sophisticated Sfumato alligator straps sourced from the Maison’s own leather Manufacture in Florence, Italy. Based on the Italian word for “smokey” or “blurred”, each individual leather strap undergoes a meticulous hand-painted process that results in a unique patina, ensuring that no two straps are ever exactly the same. Montblanc Star Legacy Ladies’ Small Second with stainless steel case and grey Sfumato alligator-skin strap, MYR11,900. A closer inspection of the dial reveals elegant leaf-shaped hands that glide across prominent Arabic numerals paired with indexes set. This spectacular display of time is set against a mesmerising exploding star guilloché pattern that draws the eye towards the centre of the watch. A smaller version of this pattern can also be found on the small seconds counter at 6 o’clock which is framed by a ring of scintillating diamonds. 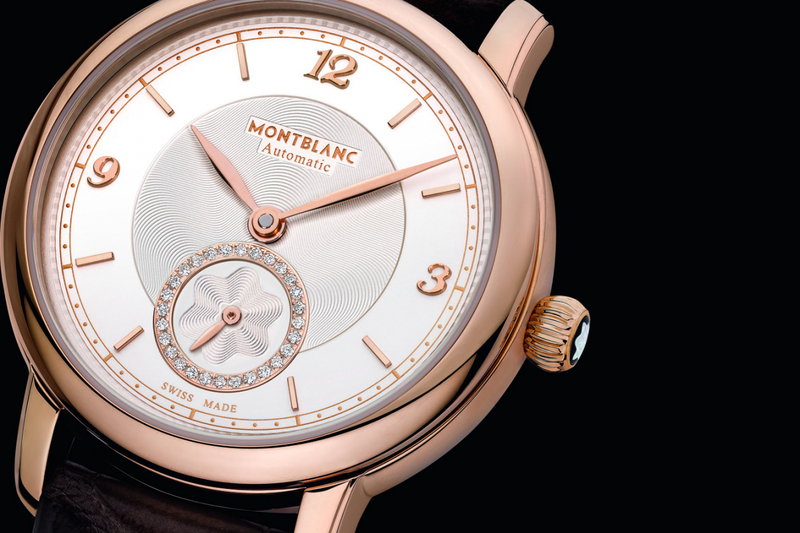 Towards the circumference of the dial is a filet sauté guilloché paired with a unique railway minute track that uses dots instead of lines similar the ones used in rare pocket watches that were made during the late 19th and early 20th centuries.